The essentials are a backpack, first aid kit, reflective vest, set of reflective triangles, a headlamp and booster cables), to round it out add these - a window breaker/seatbelt cutter, tow rope, gloves, a whistle, spare batteries and a multi-tool. You are more likely to need an emergency kit while you are traveling. We've carefully researched the best choices for a complete kit to keep your safe on the road, and the tools you need to get you going again. 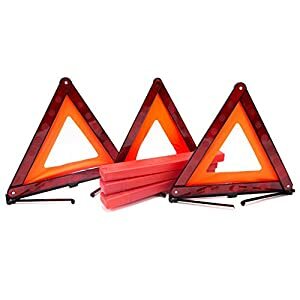 You'll want a reflective vest to put on so motorists can spot you on the side of the road even at night and a set of reflective triangles to place on the road in front of you so you don't get hit by oncoming traffic. You'll need light (and we recommend the headlamp), booster cables in case it's a dead battery, and a window breaker /seatbelt cutter so you can get out in a hurry. 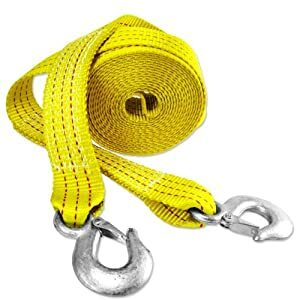 A good tow rope can get you pulled out of trouble and nothing beats a good pair of gloves, even if you're just changing a tire. Finally, a whistle to make sure you get found, spare batteries and a multi-tool. And of course, a good first aid kit. Finally, we suggest a backpack to keep it all organized, and in the event you need to get away from your car, it's great to have to carry things with you. We really, really wanted to find a pre-made kit for your car that we could recommend. And we came close. So we have one kit we can recommend that mostly ticks all the right boxes at a reasonable price. But like most pre-made kits, they make sacrifices on quality to keep the price down, and then toss in items we find questionable just to add to the number of items in the kit. So we also compiled a list of what we feel are the necessities, using much higher quality products. It costs a bit more to go that way, but in the event of an emergency you'll be glad you did. Start with these six essentials. 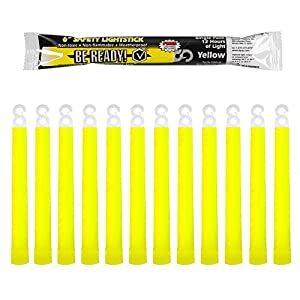 Add these to round out your kit. 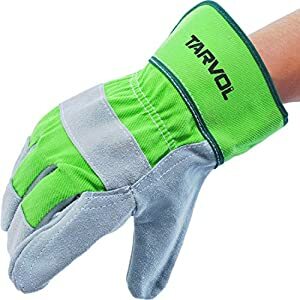 Experts recommend a good pair of work gloves, we like a car-oriented multi-tool to make quick repairs, glow sticks for more safety, a seatbelt cutter, window breaker tool for escaping the vehicle, tow straps and our favorite whistle to alert first responders. We recommend putting a carton of boxed water in the trunk (it will keep for at least 2 years and you won't have a leached plastic taste), and we adore these insulated stainless steel bottles. We've kept one in the car in the hot sun and the water stayed cold and tasting great for days. Both options are way better than plastic. Why we chose this kit: It's got most of the items you need, including a reflective vest, tow rope, jumper cables, 2 adjustable wrenches, pliers, a whistle, gloves, and a minimal first aid kit. It also comes with a rain poncho and foil blanket. It's got a hand-charged flashlight that doesn't need batteries, but we don't know how long it takes to charge it up, and we prefer a headlamp so you can have your hands free. Overall, this is the best kit we could find out there and is far better than not having a kit in your car. We'd suggest adding a better first aid kit at least. Thank you for this very comprehensive and simple to follow guide to organizing an emergency to go bag. Am very impressed. It makes me want to order some of the stuff mentioned here immediately even though we have already put together one in our car, but there are some useful stuff here which we have not thought of adding before. This is certainly a very helpful site. Thanks Daphne for the kind comment. We certainly hope you find it useful, and you find some cool stuff in our catalog. And please, as always, share this site with your friends! Did you download the Emergency Plan? It’s really worth it (and FREE! ).